#NasaInKilifi "Tourism, cashew nut plant, fishing, Education, and Agriculture will be the first priority for the people of Kilifi County, vote in Large numbers for NASA. " 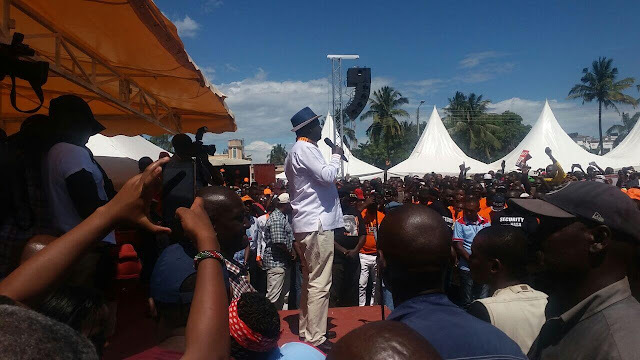 Says Raila Odinga in Mtwapa, Kilifi. - Bana Kenya News, Real African Network Tubanane. Home Mombasa #NasaInKilifi "Tourism, cashew nut plant, fishing, Education, and Agriculture will be the first priority for the people of Kilifi County, vote in Large numbers for NASA. " Says Raila Odinga in Mtwapa, Kilifi. #NasaInKilifi "Tourism, cashew nut plant, fishing, Education, and Agriculture will be the first priority for the people of Kilifi County, vote in Large numbers for NASA. " Says Raila Odinga in Mtwapa, Kilifi. The NASA today held several rallies in Kilifi calling people to vote in large numbers in the coming elections. Kilifi county is still in NASA despite the inroads made by Jubilee currently. Raila Odinga said that time has come for people to exercise their rights and make sure that Kenya is great again. "The people of Kilifi depend on tourism, fishing, and culture. Has the Jubilee government enabled tourism? Fishing? My government will make sure the tourism industry is revived and the Kilifi cashew nut is also up and running. " he said. "People along the coastal line have been left out in the development and getting the country from its colonial period. We have injustices and people are just celebrating their master's looting. We will not allow such things to happen." He added. "People must be treated equally and with respect. Developments cannot be done in one region across the country. What has it been done here at the coast that you can celebrate with the government? We need to raise standards for all people in Kenya." he added when he visited Mtwapa, Kilifi. The team is led by Raila Odinga and Kalonzo Musyoka in Kilifi while Wetangula and Mudavadi are in Taita Taveta as scheduled. The two will meet later in Kilifi to discuss the way forward of making Coastal region great with other NASA leaders and coast leaders at large.